We have heard and used forums from decades. Forums are mostly preferred to get quick assistance as a relevant pool of users instantly participates in the debate hence reaching a solution within short time period. If you have to share some idea or have something to discuss or even to solve some technical issue with seeking some expert advice, forums are the best place. If you have developed a site and need high user engagement, a relevant forum will drive excellent traffic to your site by searching those relevant topics through a forum. Forums are the most valuable assets as real time users do search and participate in finding the solution to their regular needs. Your site will get an auto-pilot as original content will be created and searched by the hundred of online users. Depending upon your need there are various forums available designed using programming language. You can install their software and start building discussions on relevant topics. Alternatively, you can embed these forums on your sites and custom domains using available tools. If you are planning to create your own forum, here are the best options. It is the most used forum all over the world. phpBB uses PHP script language and MySQL database. This forum has a large pool of registered users and hence generates healthy discussion with a good solution. If you have a healthy topic for discussion, phpBB is just perfect! Features - plugin support, private messaging, styles, anti-spam with security. It has a similar interface as WordPress and uses PHP scripting. It requires plugins to install for the each additional function you choose, but certainly more you use them more it will slower the site user interface. Other than that bbPress is flawless and widely used by millions of users worldwide. You can install bbPress in your existing WordPress blog. Features - Integration with WordPress, API support for making plugins, template tags (customize your topic related information), themes and templates support. It supports advanced PHP4 and PHP5 scripts. It is highly stable, secure and has lighter core design. It is easy to maintain and supports MySQL, PostgreSQL database. It’s a choice of many users worldwide. Lightweight and easy software forum. Additionally, you can have more features through easily available extensions. It is popular open source forum scripts with can be easily migrated from other forums such as phpBB. It also allows users add plug-ins for each new feature they need. Very flexible and preferred option among many. As a name suggests it is SEO friendly open source forum and works fast compared to others. It has inbuilt anti-spam support and mostly suitable for small-medium size pool. An excellent open source forum script with the custom made a template and unique SSI. You can integrate SMF with various content management systems such as XOOPS, Mambo etc. It supports plug-ins similar to bbpress and has a very lucrative user interface. It supports both hosted and self-hosted site. You can have different themes with it, add multiple plug-ins and supports many languages. Simple and great option preferred by worldwide users. It is open source discussion forum again has support for multiple plug-ins. It provides a strong forum software with support for themes and modifications. It uses PHP4 programming language and MySQL database. It is bug-free and stable software. Always recommended! 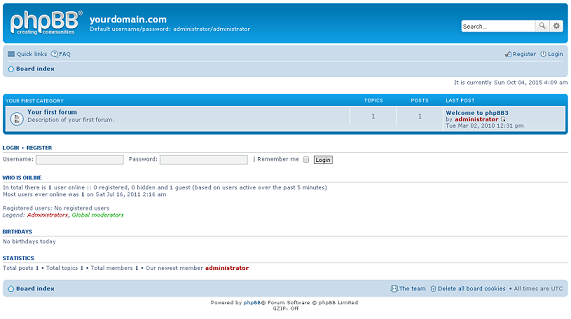 It is PHP4 script based forum accepted worldwide due to its easy UI and stability. It is oldest forum started in 19's and has an easily workable design. It is a standalone open source forum which can be easily integrated on your website. It has a great user interface with enough stability. It uses PHP scripting and MySQL database and widely used as it is a free and open source. Discourse, eXo Platform, Syndie are developed on java language. NodeBB uses its own programming language while Snitz Forums 2000 uses ASP language. UBB.classic and Ikonboard use Perl language for their design with a proprietary license. Forum-software.org has reviews for all the leading forums so that you can get full software details. Use this forum easily on your WordPress blog or site. It is simple but yet very effective forum design. It can be configured easily within few minutes. Features - Put your Adsense and affiliate links using HTML on a forum, media embedding on a forum, private message, customize topics (move their positions), skins, captcha, bb code support. A simple option for your WordPress blog. It comes with a ready plugin installed so you do not need to do major modifications. Easy to manage and fast installation. Features - SEO friendly URLs, guest posting, move posts easily, free support. It is one of the top paid forum available in the market. You can use it as CMS or a normal forum. It has all basic features included with additional management attachment and admin maintenance support. Easily add a forum to your site or blog. It can work with WordPress flawlessly again with global logins such as Google, Facebook, Twitter and major social sites. If you have more social networking database, this forum is probably the best for you. Features - Customizable CSS, bbcode, parmalinking support for sharing, lockable topics, sub-forum support, do easy topics arrangements, automatic security updates, private messaging. So, which is your choice among the above forums and do tell us why?